Thanks a lot Kaewen your DIY should be in the sticky section. Very helpful!! Yeah, this definitely helps. Just signed the lease on a c250 coupe tonight, picking it up tomorrow. Picking up another c250 coupe Jan 2nd. One has rearview, the other doesn't. I will want to add the camera to the one without. Luckily, I will have another c250 to compare it to and see if the wiring is pre-wired. I have seen multiple write-ups on comand cars having the rearview monitor cables pre-wired into the trunk. I will try to search for said posts and edit this post with the links to them. As far as the caps go, I saw them today. I am still shocked that these little suckers don't just pop-out from the back. If they don't I will just be carefully cutting it out and gluing the piece back on at the end of lease. Lease inspectors BARELY look at brakes, and other items, they will NEVER look for this little cap. And even if they did, you would have a $750 credit if you get a new mercedes to cover such "damages". Keep in mind this is specific for the pre-facelift w204, but it should be the same for the most part, and give you confidence in the install. Last edited by jctevere; 12-27-2011 at 03:43 AM. Are 2008's prewired for the camera? I see conflicting threads when I search. Anyone know where or what the cable would look like? Very nice! The caps are all one piece of plastic so you will have to carefully cut. The pre-wiring is a possibility in the 2012 although unlikely. Its still worth checking. That old DIY is still accurate, until you get t the dash. Removal of the comand unit is different now, and the wire location is also different, but it's no biggie. Probably easier to remove in the 2012. Hi guys from Spain! I was having problems with the activation of the camera. First of all, I purchase an NTSC camera and sent me a PAL one, so it displays a b/w image. In the eng menu, I can choose PAL for SRVC in a menu call, more or less,"external video settings" "input video settings" and then I see my camera in color but I dont know how to keep the changes. The second problem is the camera only work with the engine off, if you turn it on, it only appears the camera screen "check entire surroundings" but no image is displayed. Hope you may help me because I think if it was the wiring installation I wouldn´t see anything, don´t you think? P.D. CONGRATULATIONS Kaewen for your DIY! EDIT: This is the camera I have bought.They said "NTSC default PAL request"¿? Last edited by LoboGris; 02-05-2012 at 06:41 AM. Second problem , you got a wrong wiring, it need to wiring from tailight. The green&yelow wire. So, when you press R, it will send an electric to the camera. it need to wiring from tailight. The green&yelow wire. So, when you press R, it will send an electric to the camera. It's been a while since I installed camera but try to recall. I wired it to the 12V outlet and it works well. The back up light power is not a good, clean power; there were horizontal lines across the screen and slowly rotating vertically. From tail light, which? Tail light does not turn on when environment is bright so not power to the camera. Never ever wire the camera to the reverse light as a power source!!! Some people have done it without problem - they are lucky. It is an incorrect installation method. What kind of camera did you buy? Buy an "add-a-fuse" (photo attached). Make sure it is the right size (you can bring a fuse from your car into the store to compare) just remember to replace it in the right slot! Plug the add-a-fuse into an empty slot in the rear SAM (fuse box). Use a voltmeter (or test light if you don't have a voltmeter) to find a fuse that has SWITCHED power. This means it powers off when the key is out of the ignition. It turns on when you turn the ignition on. Next, attach the ground wire to a ground-point in the back. It will be a bolt with brown wires under it. Make sure your ground is clean and making solid contact. Wire the camera to the add-a-fuse. Now you have solid, safe, fused power to the camera and you haven't had to modify your vehicle wiring. The camera should have an additional wire that controls when it is on and off. THIS WIRE can be spliced into a reverse light because it is only detecting reverse, not powering the camera. HOWEVER, there is really NO reason to do this with a decent camera - I just connect the on/off wire to the add-a-fuse. This way the camera is on whenever the car is on. You will get the best operation of the camera this way. I had a Pioneer camera wired that way in my old car for ~4 years, never a problem. The power draw of the camera is VERY low and will make no difference as far as your cars electrical system / battery is concerned - even if its always on with the ignition. Last edited by acr2001; 04-08-2012 at 03:53 PM. Here I am again with good news! I have change the wiring installation, thanks to your comments,to the SAM and everything is better.Now I see the image with the engine on but still the same thing, b/w and didn't fit the screen.When I enter the engineering mode and choose video input PAL, image is in color and fits the screen So, my camera (ACR2001,I put the link of it above) is certainly PAL and I don't know if the command has to choose between PAL/NTSC automatically or not, because I can't keep the change in that menu.PANJAB, do you remember how do you configured the navi?Maybe your cam is NTSC model? I already bought the rear view camera from e-bay and the fakra-rca conector. I can't find how I need to conect the power of the camera?? Can you explain where should I conect the cables??? About the add-fuse I undestand that there I Should conect the reverse cable of the camera the one that is alone. In wich fuse should I plug this? We don't need to buy from mercedes the car with all the acsesories we can learn how install them !!! Have you any thoughts on the BOYO 422HD camera?? 2 versions, one w/license plate frame, specs look good. Cant seem to find the Kenwood model .thanks!! P.S. great DIY shots/info !!! Acr2001: do I really NOT need that expensive interface????? acr2001 is right, I am totally wrong, don't power the camera from tail light. It isn't clean and make SAM broken which cost $2000 ! The right way to use Add-a-fuse at fuse #71 or #83 (not sure, but it for cigaratee lighter front / rear). 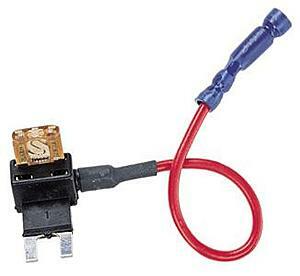 However, mine don't want to touch SAM unit, so I use an rear cigarette lighter with 12V plug & wire back to the trunk. I connected the wire to COMMAND but how can I bring the cable inside the cabin from tail gate invisibly? Is there any way to do it without having hanging wire throughout the cabin? You run it through trim. You'll have to choose the best (easiest) path and remove trim pieces to run the wire behind. I haven;t installed one on the W204, but in my W203 it started by removing the 'carpeting' on the rear of the trunk lid. 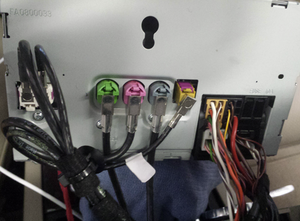 Then running the wire up the trunk hinge (where you will find other wires already, just follow them). Then remove the side panel in the trunk, run through there. Run up the side of the rear seats into the trim under the door plate and so on. Done properly the wire is totally invisible and won't get pinched or pulled. This was an interesting read. My C350 already came with a reverse camera but i my other car which is a Mazda 6 I installed and touch screen Media Center and a review camera. I bought the camera off of eBay. The media center already had a lead for the camera and it's instructions were to connect the "trigger" to the reverse switch. Being that my Mazda had a manual transmission I decided instead to run the trigger wire and the power wire back to the front, I just ran the power wire to the front and tapped into the reverse lights. It work perfectly. The camera is powered by by the head unit and not the review lights. Not sure if this help. Thank you so much for this DIY. I was able to remove the head unit and plug in the fakra cable without any issues. My problem is putting the head unit. Per the instructions, removed the screws and pushed down on the threads to remove the HU. Now when I'm putting the unit back into place, I can only get one of the two screws to catch the threads...is there a way to manually push the threads back into place? HELP! Okay, I figured it out. The threads are part of a bigger metal piece that dropped to the bottom of the opening when I pushed it down. As other people have mentioned, it's a better idea to simply unscrew the screws 1/2 way and push down on the screw heads instead of completely removing them. so you have no COMAND but the audio 20 unit.